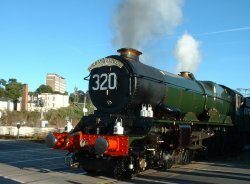 The Tarka Line is a rail line that runs for 39 miles between Exeter and Barnstaple stopping at the different stations along the way. The route, that got its name from Henry Williamson classic novel 'Tarka the Otter', follows the river valleys of the Creedy, Yeo and Taw for part of the journey. From Eggesford the line also then forms part of the 180-mile beautiful Tarka Trail. 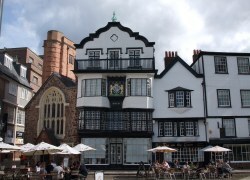 See the main Exeter Things to Do page for more ideas and other area Attractions. At the various rural stops you can stroll around the towns and villages viewing and exploring the interesting sights. Also, as the line forms part of the Tarka Trail you may even like to try a hike or cycle ride along part of its route. 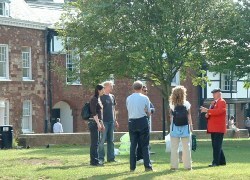 Personal cycles can be used, although there are some hire facilities available. The Tarka Trail was opened in 1992 and got its name from the main fictional character and hero 'Tarka' from Williamson's book (first published in 1927). The Trail splits into 2 loops to follow Tarka's tumultuous journey and is made-up with a collective of footpaths and cyclepaths incorporating various sections of disused railway lines around north Devon.